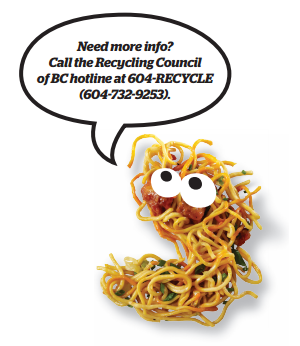 Ridge Meadows Recycling Society supports the diversion efforts of Metro Vancouver. On January 1, 2015, Metro Vancouver’s placed a ban on organic materials at its waste facilities. This means residents and businesses are now required to separate organic materials like kitchen scraps and yard trimmings from their regular garbage. Since the Organics Disposal Ban came into effect January 1, 2015, thousands of tonnes of food scraps have been recycled. In the first four months of 2015, only 58 loads (15 per month) were out of compliance. Early results are encouraging, and indicate that in general large generators of food waste are successfully recycling food scraps. · Reducing the amount of methane coming from our landfills, generated when food decays in poor conditions. · Taking the pressure of landfill space, which is limited. Currently about 30% of our food ends up there. · Making our waste to energy facility, which takes about a third of the region’s waste, more effective by reducing the moisture content of the waste being incinerated. · Turning the food scraps into compost and biofuel, which can grow more food, or help avoid using fossil fuels. The ban applies to all garbage generated across the region, from Lion’s Bay to Langley. The way we manage our waste is changing. Metro Vancouver is responsible for long term planning and disposing of the waste generated by residents and businesses in the region. Managing the waste system needs to be responsive to our citizen’s expectations of high environmental stewardship, as well as being kept affordable. Organizations and individuals have demonstrated commitment to the success of this regulation, through establishing residential and commercial food scraps recycling programs throughout the region. Member municipalities are supporting residents so that most single homes have a food scraps collection program available. · online resources on food waste reduction from the popular Love Food Hate Waste campaign. Note: If you are interested in purchasing a bear-resistant container for your organics, the City of Maple Ridge is subsidizing bear-resistant containers for Maple Ridge Residents – find out more here. Finally, here’s a video showing what happens to food scraps once garbage haulers deliver them to Harvest Power in Richmond. For tips on reducing your food waste, visit the Love Food, Hate Waste website.